Property lines contribute to healthy communities. If you have clear property lines, maybe even good strong fences, as the illustrious Robert Frost recommended, you know when someone is trespassing, and you can hold him or her accountable. You know what area falls within your responsibility to mow and maintain, and what areas belong to others. Emotional boundaries work the same way. They form clear lines of responsibility and ownership, bringing good clarity and communication between relationships. Strong emotional boundaries, like strong fences, bring beauty, order and health to communities. 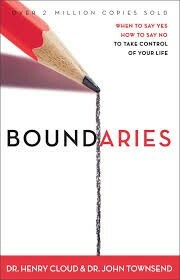 Dr. Henry Cloud and Dr. John Townsend have written the wide-spanning book Boundaries for Christians, exploring each area of life affected by this significant concept. Friendships, church membership, business, marriage, finances, and family—all are deeply affected by the quality of our boundaries, yet it is a sorely misunderstood concept. Clear teachings from God’s Word bring peace and benefits. Here are six brief boundary principles explored more fully in this helpful book. 1. Marriage and Adulthood creates new boundary lines. Biblically, children are under the authority of their parents until they come of age and move out under God’s authority and into their own responsibilities. Both children who continue to depend on parents for help (financially or otherwise), and children who continue to feel obligated to please and obey their parents are injuring God’s natural boundaries. This does not mean we do not care about our parents, but they are no longer our highest authority. We consult God, ourselves, and our spouse first and take care of our own boundary lines in life. 2. Friendships are based on attachment and strengthened by boundaries. Friendships are differentiated from work, church, or marriage relationships in that they are formed only by attachment—two people who enjoy each other or common interests. This creates loose bonds, easily formed and easily dispatched with plenty of room for conflict. Friendships formed out of obligation, guilt, or codependence are not healthy and will inevitably breed conflict. God gives us freedom to enjoy certain people based upon temperament, interests, similarities, and compatibility. He doesn’t ask us to be friends with everyone. We can have good healthy bonds with work and church members, extended family and relatives without feeling pressured to be “friends” with everyone we meet. This would imply we will enjoy everyone, something we don’t always have control over. Friends are very significant, but they do not replace God, and we need to develop several deep friendships, so that we are not putting unrealistic expectations on any one friend. 3. Marriages need healthy separation. Due to the one-flesh nature of marriage, boundary issues are most rampant in this sacred union and most important to be solved. The bond is like none other on earth except with that of Christ, but the identities are separate, as well as the roles, responsibilities and personalities. God did not design that married couples become one conglomerated person, unable to function apart from our spouse. He designed us to be healthy, whole, and fulfilled in Christ, and from that union, we love our spouse and find joy in a mutually beneficial and sacrificial relationship. Sometimes that means we need to tell our spouse “no” when they are not exercising self-control. In the book, the authors gave the example of one spouse who continually makes the other late to events. Years of nagging produced no effect, but when the punctual spouse finally just left to arrive on time without the other, the left-behind spouse had to face the consequences of her actions. When she did, she quickly changed her ways. This was not unkind on the part of the punctual spouse, but rather resulted in necessary personal growth for the tardy one. This example demonstrates a healthy separation when actions are causing anger or sadness. 4. Compliant people (people-pleasers) need stronger boundaries. While boundaries provide good healthy principles for everyone, compliant personalities tend to be the most boundary-injured, due to their strong inner desire to please those around them. What they do not realize is that they are not doing anyone any favors by allowing their boundaries to be overstepped. Boundary-injured people often feel used and overlooked, out-of-control and unable to say “no”. They have much resentment and anger hidden inside, which comes directly from not keeping strong boundaries. People pleasers tend to expect that those they are trying to please will automatically know and respect their boundaries—such as when they have given of themselves to exhaustion and need a break. Actually it is the responsibility of the exhausted one to admit their need of a break. Compliant people will find themselves happier, stronger and more able to love those around them when they increase the strength of their inner boundaries. 5. All of us need to respect each other’s “no.” This is especially significant in church work. Because churches operate largely on volunteers to fill needed service roles, much room exists for resentment, obligatory service, and boundary conflict. Bottom line: If you ask someone to serve and he or she says no, respect them for knowing their own boundaries. Filling the spot is your job, and everyone else is not obligated to do it for you by saying “yes”. Don’t gossip about those who say “no”; respect their time and heart enough to accept the “no” graciously. None of us truly knows what others carry, what secret burdens or hurts lie under the surface. What may be easy service for one could bring much inner turmoil for another. What if a woman suffering after a secret miscarriage is sneered at by the nursery coordinator because she declines to serve for a month or two? The best, most loving way is for us to respect the “no’s” and trust God to convict (which He will!) when someone is truly being lazy or unloving with their time. 6. Sometimes we need to let others reap what they sow. This is a toughie for the Christian community. We want to bear one another’s burdens, live a life of love and serve in compassion ministries. And we should! But that doesn’t mean we don’t exercise discernment in the body of Christ as we serve. In unexpected times of crisis, we certainly come alongside one another to help bear the burden of life that has become excruciating. But in daily life, the Bible says, “Each one must carry his own load (Gal 6:5).” Continually rescuing an irresponsible person from the consequences of his behavior is not wise or loving; it interrupts God’s natural pattern: If a man does not work, he does not eat. To help a person break bad habits in his or her life, they must feel the consequences of the behaviors. As Christians, we are keenly aware that Christ sowed a perfect life, so we could reap eternal life. He did interrupt the Law of Sowing and Reaping by bearing our consequences, so we could avoid punishment for our sins. Sometimes, I believe God will call us to take that role for others, but as a general rule for life, we are not the Christ. Each of us has a different, unique daily load to bear and God alone will give us grace to succeed. Boundaries provide good, strong wisdom rising directly from the heart of the Word of God. May we understand, respect and practice this wisdom in our lives.